• Structure: Lock & Dam #11. • Location: River Mile 583.0. 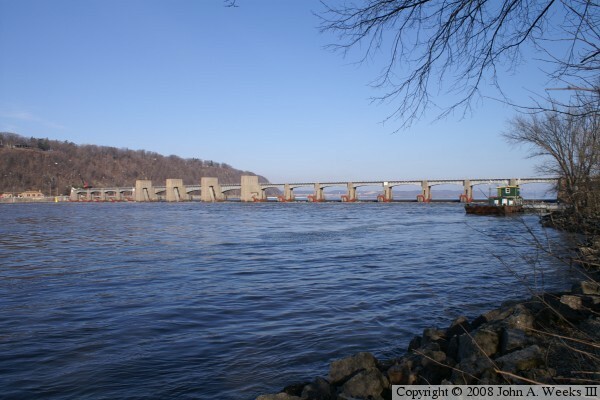 • Dam Width: 5,200 Feet Overall, 1,278 Foot Wide Dam Structure. • River Elevation (Pool): 603 Feet. • River Elevation (Outflow): 592 Feet. • Water Fall: 11 Feet. • Annual Lock Traffic: 7,320 Vessels, 16,348,000 Tons (2005). • Date Opened: September 14, 1937. 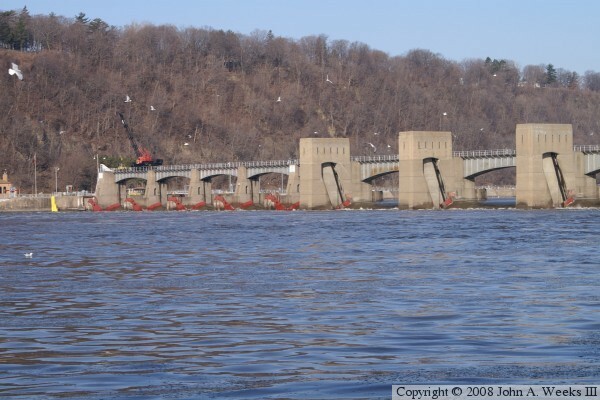 Lock & Dam #11 has been in operation since it first opened in 1937. Its systems are 70 years old, and are in danger of failing. Given the age of the equipment, spare parts are a real problem. Lock operators suggest that it could take 60 days or more to machine new hardware components if the lock were to break in some manner. As a result, a major rehabilitation project is slated to start in late 2007. 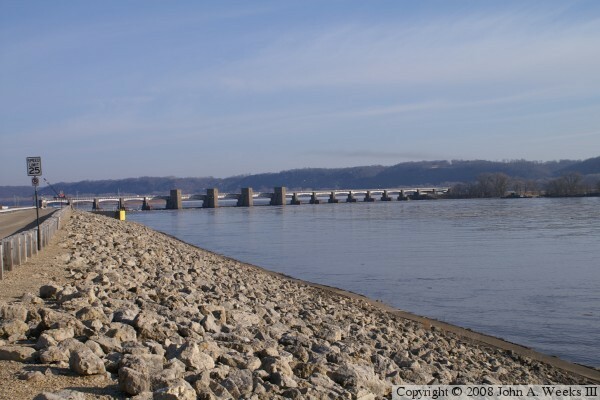 The lock and dam structure is located about 3 miles upstream of the new US-61 and US-151 river bridge on the north side of Dubuque. The final photo below is a view from that bridge. 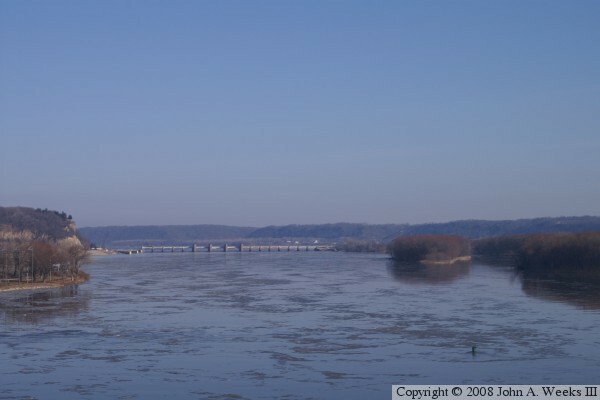 Despite the lock and dam being located so close to Dubuque, the city itself has been slow to opening the river front as a tourist attraction and a place for people to live. While the casinos have helped to open a small portion of the riverfront, much of the Dubuque riverfront remains heavy industry and blighted brownfield area. 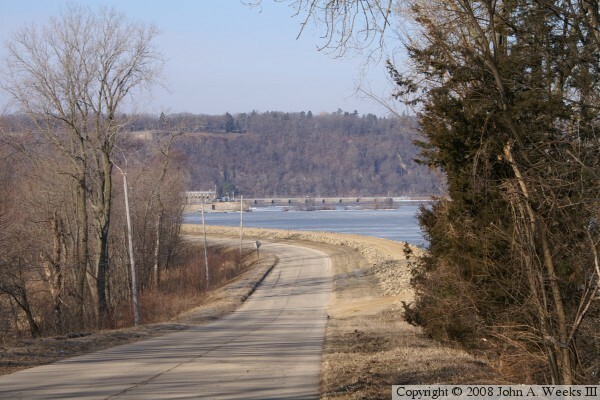 The lock and dam could be a tourist attraction, but the road to the lock and dam is closed to the public, as is the road to the Iowa end of the old Eagle Point Bridge. 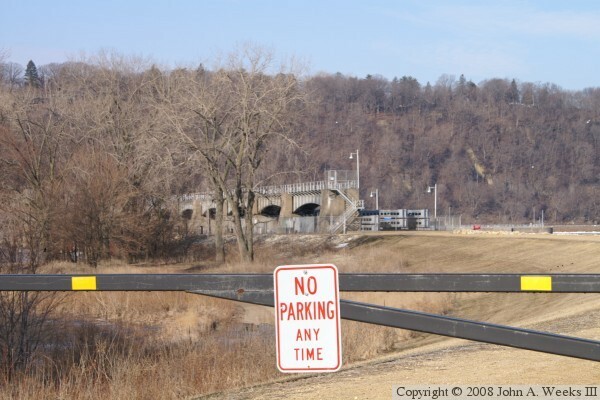 Dubuque really needs to work on redevelopment of the river front to allow people to connect to the river, rather than simply using it as a tool for outdated types of manufacturing.